Prepare chayote: Peel off the skin and remove the core. Rinse to remove the sliminess of the chayote. Cut into small bite size. Put in a bowl and sprinkle some salt (no more than 1/4 tsp). Rub salt into chayote with your fingers. Set aside for it to draw out the liquid. Rinse with water , then squeeze out as much water as possible. Pat dry. 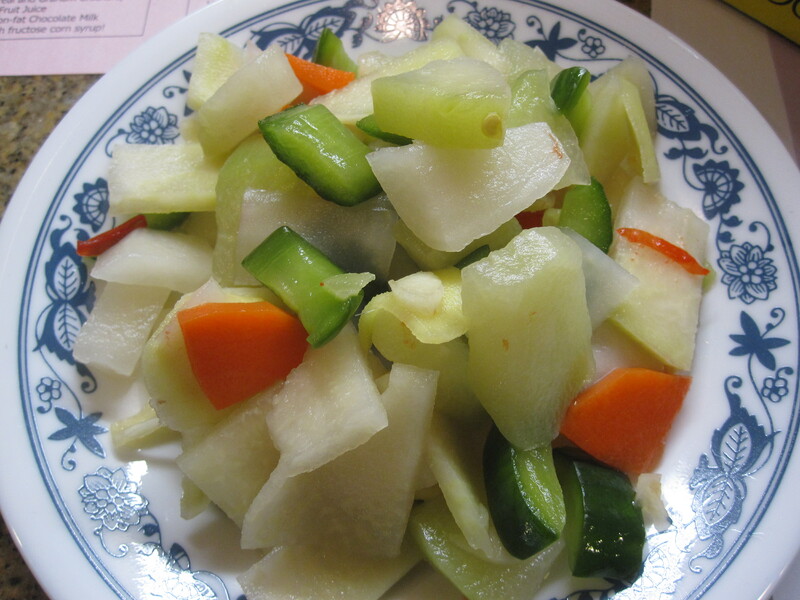 Prepare kohlrabi: Remove the outer skin of kohlrabi, then cut into small thin size. Put in a bowl and sprinkle some salt (no more than 1/4 tsp). Rub salt into kohlrabi with your fingers. Set aside for it to draw out the liquid. Rinse with water , then squeeze out as much water as possible. Pat dry. Prepare carrot: Peel off the skin and remove both ends. Cut into small bite size. Put in a bowl and sprinkle some salt (no more than 1/4 tsp). Rub salt into carrot with your fingers. Set aside for it to draw out the liquid. Rinse with water , then squeeze out as much water as possible. Pat dry. Prepare cucumbers: Remove both ends and the core of cucumbers. Cut into small bite size. Put in a bowl and sprinkle some salt (no more than 1/4 tsp). Rub salt into cucumbers with your fingers. Set aside for it to draw out the liquid. Rinse with water , then squeeze out as much water as possible. Pat dry. Prepare daikon: Peel off the skin and remove both ends. Cut into small bite size. Put in a bowl and sprinkle some salt (no more than 1/4 tsp). Rub salt into daikon with your fingers. Set aside for it to draw out the liquid. Rinse with water , then squeeze out as much water as possible. Pat dry. Combine all vegetables, garlic and peppers in a large bowl (non metal, non plastic). Add enough sushi vinegar to cover half of the vegetables. Then add enough water to barely cover the top of vegetables. Add sugar to taste. Stir with a spoon until sugar dissolves. Cover and let it sit in the fridge for at least 1 day for the marinade to soak in. Stir the vegetables the next day and continue chilling in the fridge. Pickled vegetables last at least 2 weeks if kept well in fridge. Be sure to use a clean dry spoon to take out a portion for consumption. How to pick kohlrabi: Pick young kohlrabi that is more greenish rather than pale color, preferably with a little green leaves on the top. Old kohlrabi will have tough, chewy fibers/roots throughout the vegetables that make it impossible to use for making dishes. How to pick cucumbers: Always pick cucumbers that are firm. There should not be any wrinkles on the skin or else it’s not fresh. How to pick daikon: Pick daikon with smooth skin. Check the cut stems– they should look freshly cut. Put daikon in your hand and it should feel heavy to you. If it doesn’t feel heavy the daikon might be old or hollow inside.